learn from our mistakes and celebrate our successes. The ICRH is a seasonal, rotating shelter. Each week, a different host site opens their doors to ICRH guests and serves as warm, safe place for those in need. Along with the host sites, other churches or organizations will serve as partners who may not possess the space or resources to house ICRH guests but, provide support to the host site. 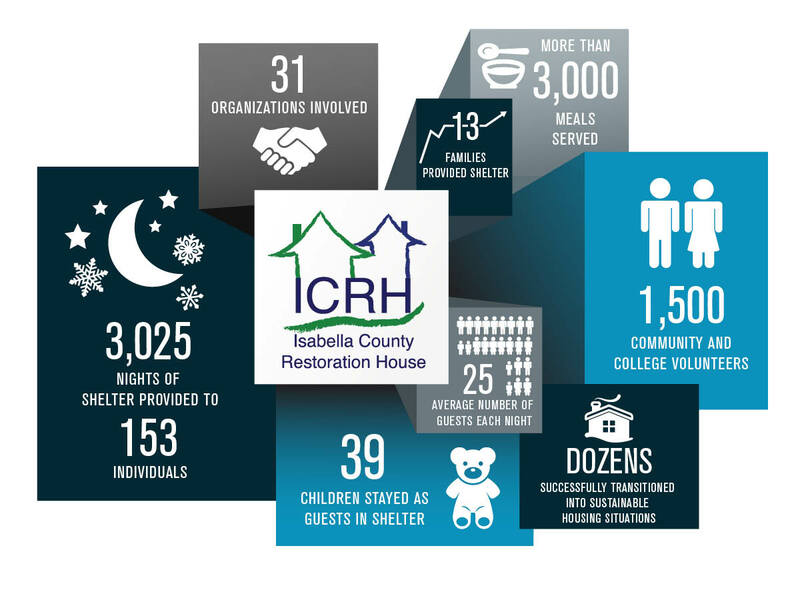 Presently, the ICRH partners with 19 host site churches, and 9 partner churches. For the 2017-2018 season, that allowed the ICRH to remain open to provide emergency shelter from October 28, 2017 until April 15, 2018. Every day during the shelter season, from 4:30 pm—6 pm, ICRH guests check-in at the Strickler Nonprofit Center (1114 W. High St., Mt. Pleasant, MI 48858) to ensure their stay in shelter. I-Ride and Stargazer Transportation, two very generous ICRH partners, provide transportation for ICRH guests to their destination from the intake center to the host site. Guests leave the host site the following morning at 8 am when they are transported to the Isabella County Soup Kitchen.